The acquisition of Khalil Mack just before the start of the 2018 season has shifted the landscape of the NFC North division and has made the Chicago Bears legitimate contenders in the NFC. While it may have seemed like a steep price to pay for Ryan Pace the move is paying off and we want to thank Oakland Raiders’ head coach Jon Gruden with a special gift package sent to team headquarters. Forum members on ChiCitySports.com came up with a great idea to raise money and send gifts to Gruden thanking him for trading away a dominant player like Mack. We have all enjoyed watching Mack dominate this season with his eight sacks, five forced fumbles, two fumble recoveries and one interception return for a touchdown. As Bears fans, we know a thing or two about watching great defensive players and Mack is no exception. In addition to the gift basket and items, we also wanted to donate to Jon Gruden’s FFCA Charity to help support youth and high school sports across the country. The charity does great work to make help aid student athletes, coaches and parents throughout the country. To find out more about the charity, please click here. On behalf of the entire Chicago Bears fan base, we at ChiCitySports.com want to say THANK YOU! We are very appreciative that you would decide to trade us Khalil Mack. If you haven’t noticed, he has been playing exceptionally well for us. In return, we would like to re-pay you. Enclosed in this package is a handful of items we’ve carefully selected. Each item shows a level of appreciation for your organization and Khalil specifically. The fruitcake….well that is just fruitcake because Christmas? The fans at ChiCitySports.Com decided to raise money for this care package. After picking some items out for your enjoyment, we did want to make a contribution to a relevant charity as well. We are donating $100.00 to Jon Gruden’s FFCA Charity. If you can help pass this on to relevant sources, it would be much appreciated. Especially Jon. We are open to additional donations that will be sent to Gruden’s FFCA Charity. If you’re interested in donating to the charity, please click here. Fruit Basket (It’s a general way to say thank you). Thank You card (We wanted to say thank you again because he’s really good). Chucky Mask Gruden’s nickname is Chucky). Visor (For the same reason). Nerf Football (It was one of the footballs that Mack has stripped and recovered). Fruitcake (Because it’s the holiday season). Mack Truck 18 wheeler (Mack is a force/Mack truck). Bear (because Da Bears, obviously). We hope that coach Gruden and the Raiders enjoy this package as much as we’ve enjoyed Mack playing in the Windy City. 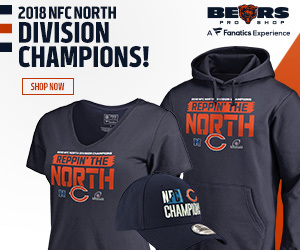 ← Forever Collectibles has perfect Bears gifts for everyone!